Alan - Kitchen Accessories Shopify Theme is no doubt a ground-breaking design of Shopify Theme. 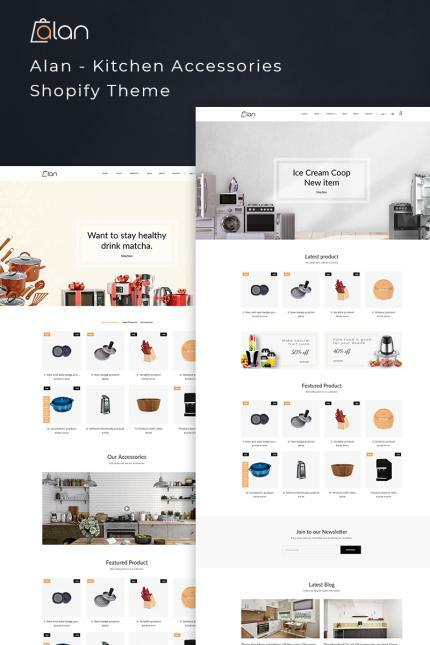 This elegant white-background Shopify theme is carefully crafted to build eCommerce shop selling Kitchen Accessories like- Blenders, Mashers, Peeler, Cutting Boards, Colander, Grater, Whisks, Food Mill, Ovens, Frying Pans, Knife, Food Storage and what not. However, Alan is a feature-focused theme that brings ease for both the authors and the visitors. It has Drag & Drop, Theme Color Options, Newsletter Popup, Product Popup, Multiple Currency Support, Drop Down Menu, Mega Menu, Featured Product, Product With Carousel, Product Zoom and many more. Alan eCommerce Shopify theme is 100% Responsive & Cross-Browser compatible as well. It has 404 Page, Testimonial, Google Font, Ajax Cart, Contact Form and many more user-friendly features. In addition, for the visitors there are Pagination, Product Share, Disqus Comment, Product Review, Collection Sorting, Related Product, Product Zoom, Post Share, Post Comment and multiple Blog styles in this theme. Install this complete eCommerce Shopify theme to challenge the trend.